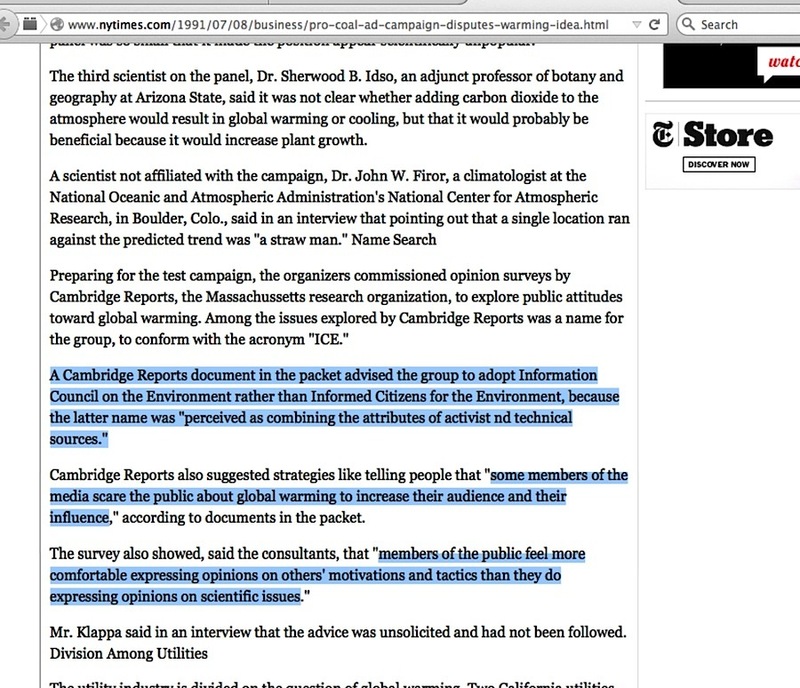 The collective enviro-activist movement wants the public to believe global warming science is settled and that opponents may be dismissed out-of-hand due to ‘extensive documentation’ of skeptic climate scientists’ industry corruption. I’ve already pointed out, here and here, how there is no independent corroboration for the accusation. 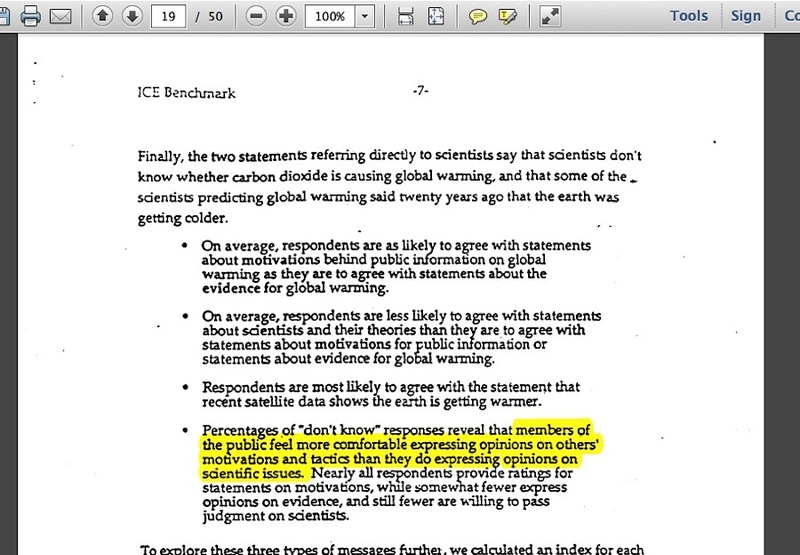 Worse, the so-called smoking gun core evidence for the accusation, leaked memos attributed to the obscure Western Fuels Association’s 1991 “Information Council for the Environment” (ICE) public relations campaign are not what Naomi Oreskes, Al Gore, Ross Gelbspan and others say they are. 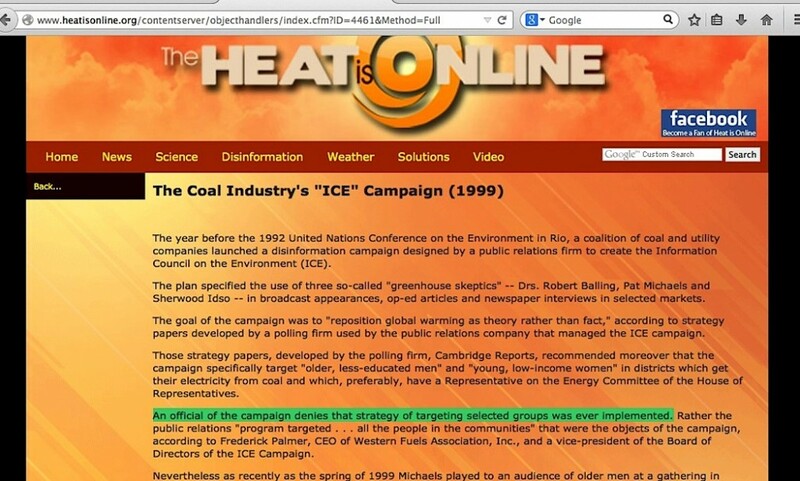 For the benefit of new arrivals to this blog who have not yet had the chance to read through my prior material, the nutshell of the explanation is that for the last 20+ years, enviro-activists have only one solitary bit of evidence to point to when they say skeptic climate scientists conspire to misinform the public in a manner mimicking what shill experts did for ‘Big Tobacco.’ Namely, the leaked coal industry memo phrase “reposition global warming as theory rather than fact.” Uncountable numbers of people repeat it, but only a select few saw the memo firsthand – Al Gore featured it full screen in his movie in direct comparison to the infamous leaked tobacco industry memo “Doubt is our Product.” “Merchants of Doubt” book author / movie star Naomi Oreskes prominently mentioned it in her 2008 Powerpoint presentation (full text cache here) and fixated on Western Fuels Association material, including that phrase, in her 2010 book chapter. 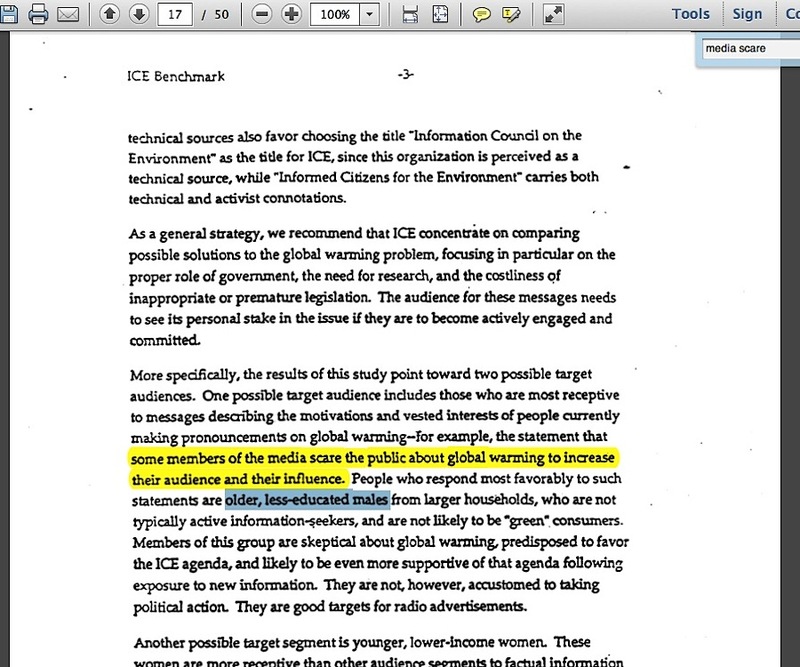 Then there’s Ross Gelbspan, and the fame he derived out of his 1997 quotes of ‘ICE memos’ phrases ….which turn out to be a subset that never actually was part of Western Fuels’ ICE campaign. As I noted in my October 2015 post here, it took me seven months just to find what was described as the actual collection of Western Fuels ICE memos. I found them in Greenpeace’s scan archives. 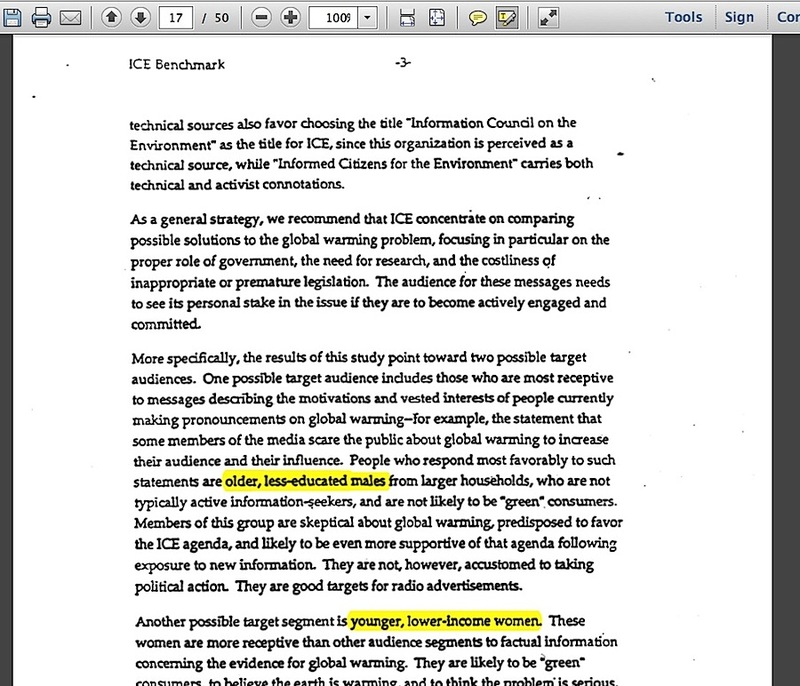 The subset containing the “reposition global warming” strategy phrase and “older, less educated males,” / “younger, low-income women” targeting phrases that Gelbspan and others love to quote are Greenpeace’s scan pages 9, 10 and 11, and then continuing from 16 to 23. Readers can’t miss the strategy phrase on page 10; the targeting phrases are on page 17. For me, the first hint of a problem with this subset is something essentially every objective observer of the document scans can physically see for themselves. 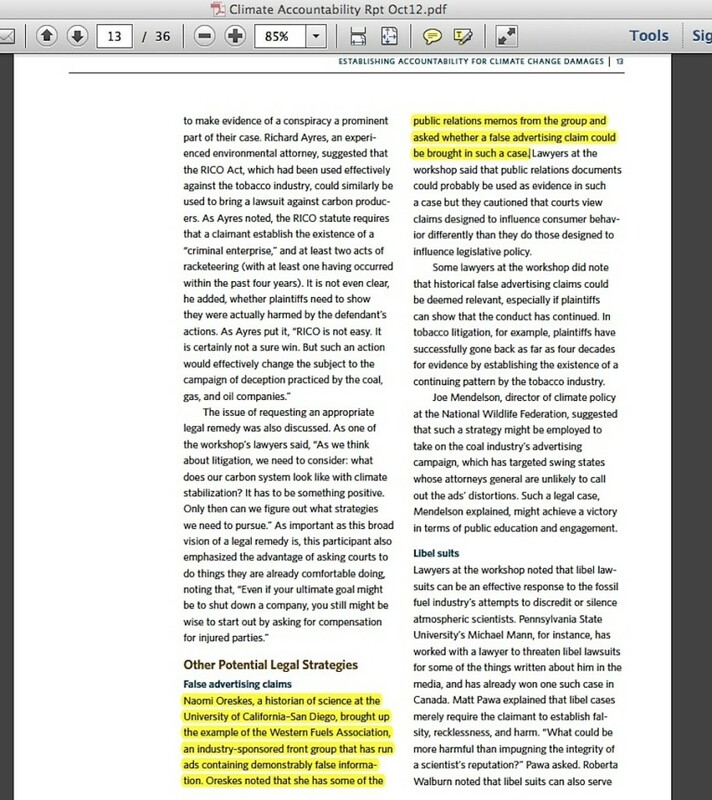 Compared to other pages which are obviously the Test Market Proposal (pages 26 through 34) and the newspaper/radio ad placement and interview schedules (pages 37 through 40) – arguably the actual documents used to set and run the PR campaign — the letter style and page formatting of the strategy/targeting memo subset is not the same. Mr. Klappa said in an interview that the advice was unsolicited and had not been followed. An official of the campaign denies that strategy of targeting selected groups was ever implemented. How can a common citizen like me corroborate this situation with the memo subset contradicting what is commonly believed about its “smoking gun” portrayal? I can’t. I don’t have the clout to interview people who would directly know about whether the subset was a part of the ICE campaign or not. But there are people who can undertake these kinds of interviews. …[the Edison Electric Institute] had its own Climate Task Force which publicly denounced Western Fuels Association’s attempt to form a skeptic coalition. 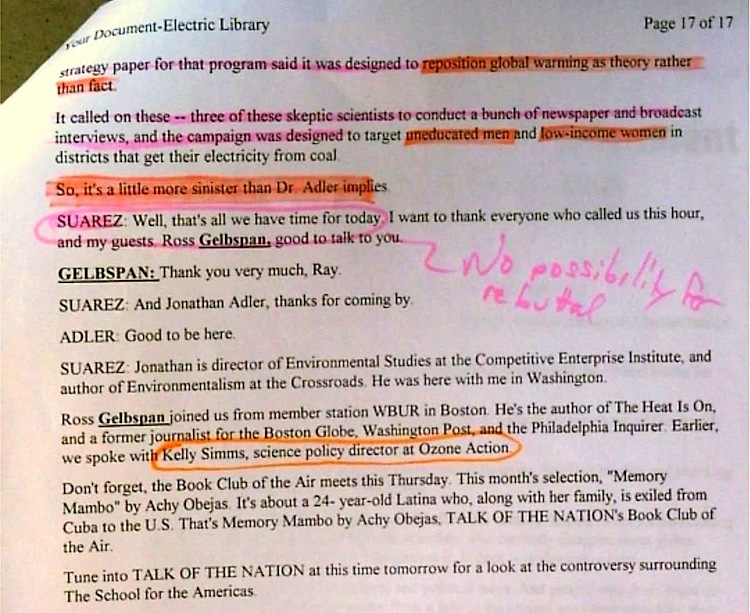 EEI coordinated the most misinterpreted single document of all the “memos,” which was originally contained in a bulky 100-plus page package sent to EEI from opinion survey firm Cambridge Reports of Massachusetts. 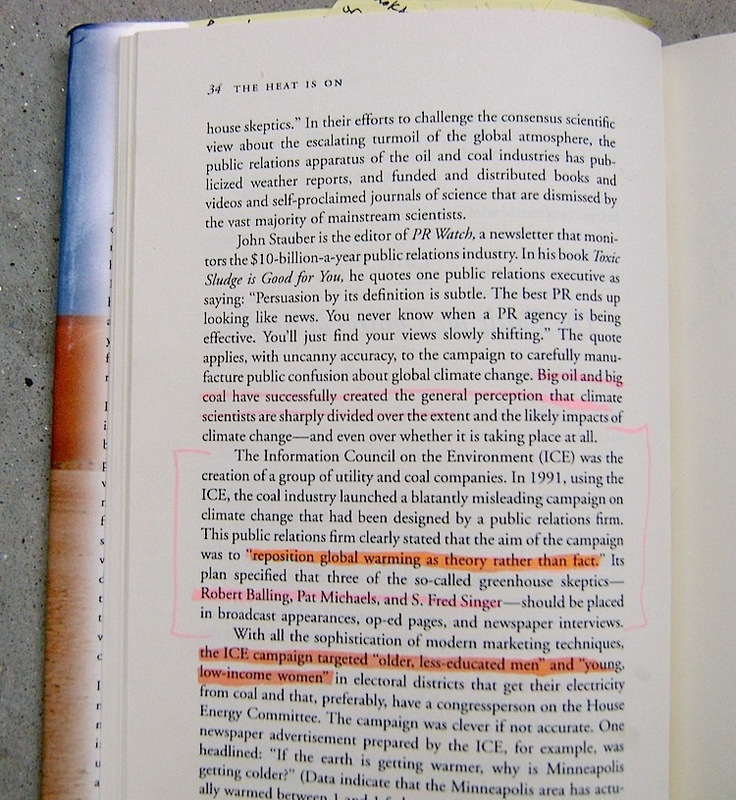 The fateful page was in a routine public opinion poll and proposal for a related campaign of the type that EEI regularly commissioned, this year on public attitudes about global warming. 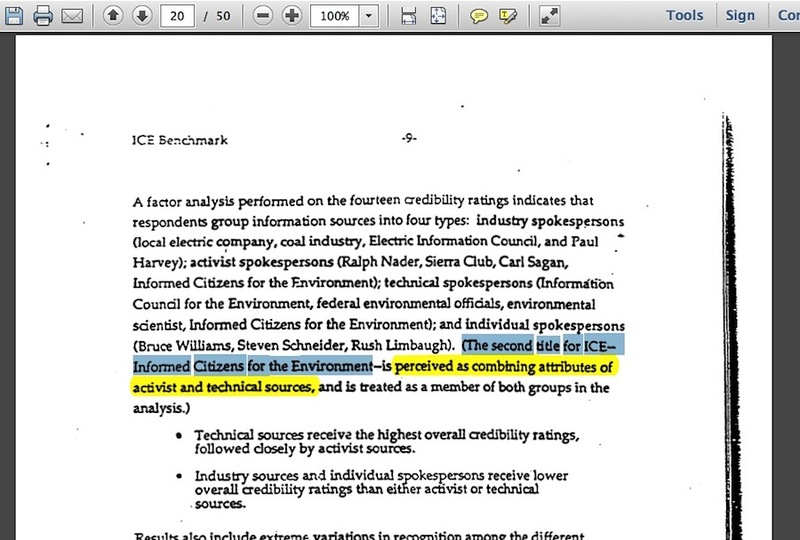 The Western Fuels climate skeptics picked the semi-humorous acronym “ICE” to use in creating a name for themselves, and asked EEI’s communications executive to include that and numerous other requests to Cambridge Reports for inclusion in the report. He agreed. EEI gave a copy of the resulting 100-page report to WFA’s Washington public relations firm, but the WFA CEO never even saw it, and when interviewed and I asked about it, he said WFA would never use “Reposition global warming as theory (not fact)” because it was too abstract and egg-headed for its rural audience. 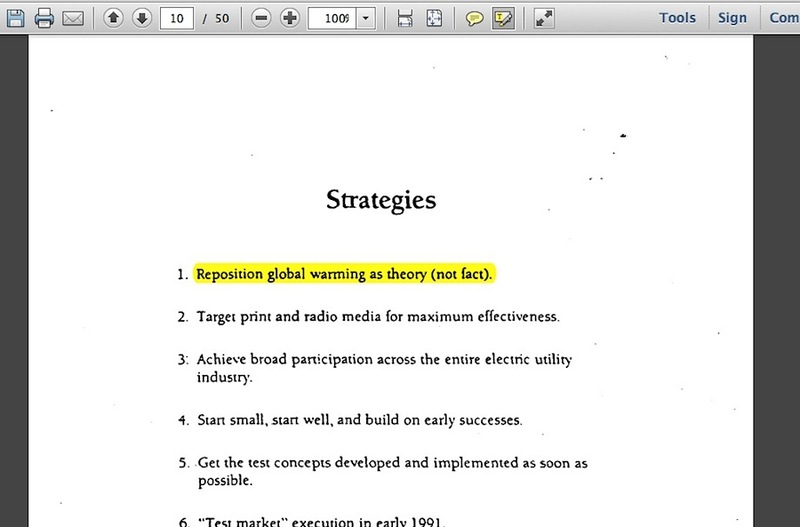 WFA’s communications director says that, unlike his CEO, he saw the page and had no idea how to “Reposition global warming as theory (not fact),” so he left it in the pile and selected useful pages to send to Simmons in North Dakota. Not only did the skeptic climate scientists not get the memo which supposedly indicts them as industry conspirators, the top industry person supposedly at the genesis of a sinister and later industry-wide conspiracy – as Al Gore would have the public believe – never got the memo. Ron Arnold’s piece is about Naomi Oreskes’ role in this whole situation. But she isn’t merely a past history element; in a 2012 on exploring the angle of using racketeering laws to prosecute companies and organization siding with skeptic climate scientists, Oreskes suggesting using old Western Fuels material as a weapon as part of that court action. The huge question here is what did Oreskes, Gelbspan and Gore know about that memo subset, and when did they know it? 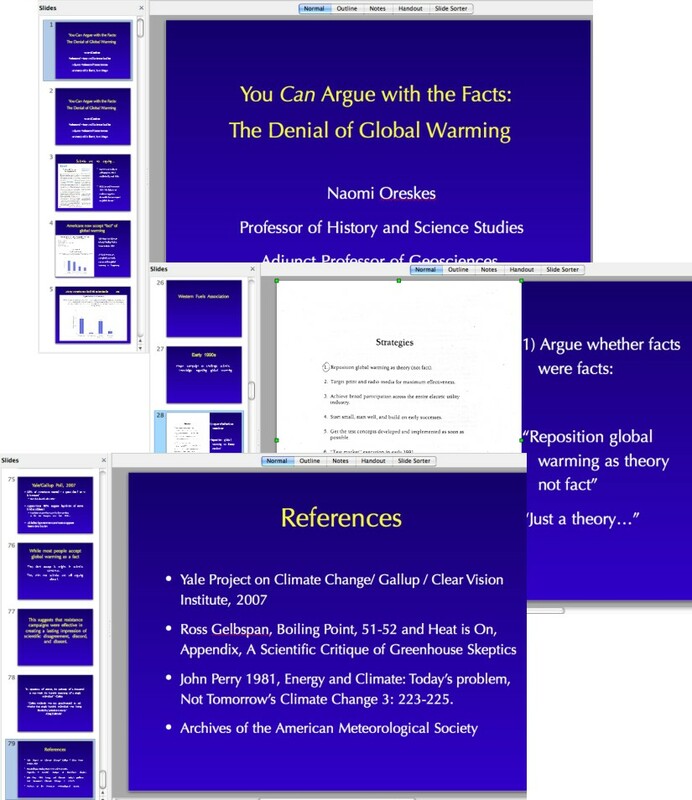 If any one of them knew this material was worthless from the start as evidence of a fossil fuel industry conspiracy, but maliciously pushed it anyway to destroy the character of skeptic scientists, would this not be an epic form of libel/slander? 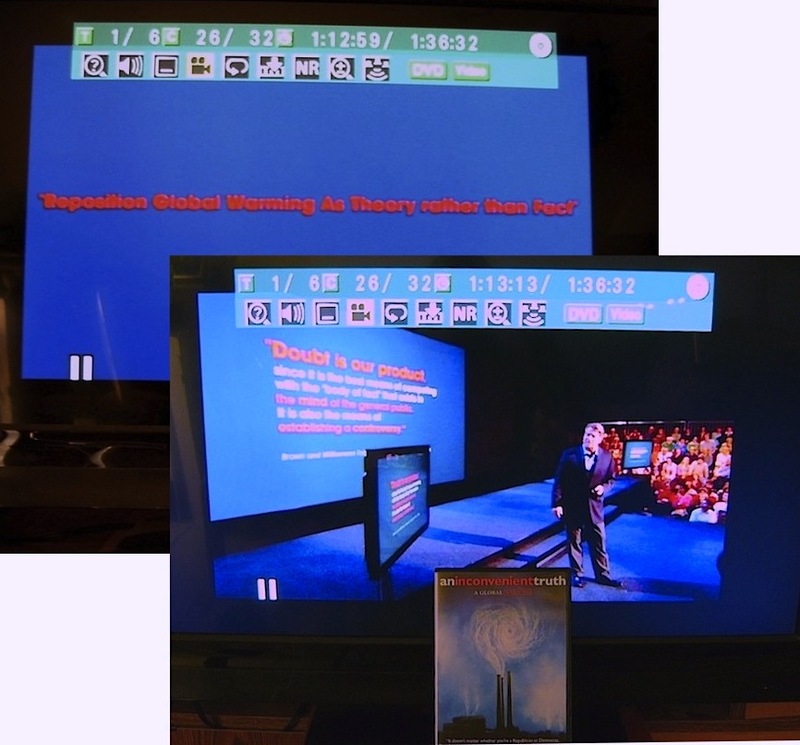 This entry was posted in accusation repetition, Information Council for the Environment and tagged Naomi Oreskes, Western Fuels Association by Russell Cook. Bookmark the permalink.